Why hike to Spillway Lake? It's a pretty, if not spectacular, high-country lake, with 12,000+ foot mountains rising from its south and west banks (Kuna Peak and Kuna Crest, respectively), and the trail's gentle incline makes it a good way to get acclimated to the high elevations along the Tioga Road. It's hard to make predictions about creatures that aren't known to wear waterproof watches or sign even short term leases, but Spillway Lake might turn out to be your favorite place in Yosemite if you love the splashy sounds made by fish jumping in the early evening. Best Time to Visit: The lake's inviting any time the Tioga Road is open. Given the elevation, though, the trail will probably be covered with snow the first few weeks after the road opens, and portions of the trail and the area around the lake may be too marshy for your tastes until mid to late summer, depending on how wet the previous winter was. If you're visiting the lake earlier, a pair of wading boots might be worth the extra weight. Crowd Factor: The main branch of the trail is popular with backpackers, and the lake itself attracts fishermen. The trail ranks about a 10% on the "chance of getting embarrassed if you don't find a bush to pee behind" scale (higher if you're hiking with friends, presumably, and possibly even higher if you're hiking with parents or in-laws). It's still practically abandoned by Yosemite Valley standards, though. Difficulty: Medium, but only because of the elevation. The trail climbs gradually through a pair of creek drainages and is never particularly challenging, with the possible exception of a few stream crossings that can test your rock-hopping skills. Parking: The lot at the trailhead holds a dozen or so cars, with a bit more space along the shoulders of the road. It can fill up on weekends, so be prepared to seek an unoccupied pullout up or down the road and walk half a mile or so to reach the trailhead. If the bear-proof food lockers are all full, you should be able to find one with room for your cooler if you look through the copious supply at the Tuolumne Meadows Lodge's large parking lot, just east of Tuolumne Meadows and about six miles (9.5 km) west of the Spillway Lake trailhead. Nearest Bathrooms: Pit toilet at the trailhead. Your more bacteria-phobic friends might prefer a stop at the Tuolumne Meadows Visitor Center, 7 miles (11 km) west, where bathrooms with plumbing can be found. Nearest Snacks: There's a cafeteria/mini-mart near the eastern edge of Tuolumne Meadows, 6.5 miles (10.5 km) west. Tuolumne Meadows is the commercial center, after a fashion, of the Tioga Road area, so it may be a bit crowded. Unlike the stores at the various High Sierra Camps, though, it's not supplied by mule train, so restockings are more reliable and you should be able to satisfy your candy bar jones. 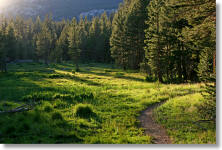 Getting There: The trailhead is at the far eastern end of the park, just a mile west of Tioga Pass. If you're approaching from the east, you should pass the trailhead within a few minutes of entering the park. If you're anywhere else, you'll need to head to the Tioga Road and follow it east for 46 miles (74 km). Watch for the Mono Pass trailhead sign; here's a Google Street View panorama of the trailhead area. Trail Notes & Hazards: There are a few stream crossings early in the early going, which also has some rocky stretches. You should be able to find rock or log crossings; walking sticks are helpful if you choose the former. Less than a mile from the lake, the trail crosses a meadow that could be swampy in spots, and much of the area surrounding the lake itself may also be marshy; several small streams end their days on the south and west shores of the lake, contributing to the area's general squishiness. Unless you're hiking in the fall or late summer, you might profit from packing a pair of wading boots. And this has probably already occurred to you, but mosquito repellent is a must, and it wouldn't hurt to deflect unwanted attention by bringing a friend who's a known mosquito magnet. Getting to the lake's western shore requires crossing either the inlet or the outlet, and both are tricky. The outlet's degree of difficulty is raised by the presence of low bushes along its banks. You'll probably have to hike 50 meters or so below the lake to find a rock-hoppable spot that won't have you belly-flopping into a shrubbery. It's still a bit iffy, so if you're hiking with friends, bring a video camera to capture the moment. To get across the lake's inlet, follow it upstream from the lake until it forks - say, a hundred meters or so - and not far upstream from the fork, you should be able to find spots where you can cross the two narrower streams with a minimum of pratfalls. These streams, incidentally, are the outlets for Parker and Helen Lakes.